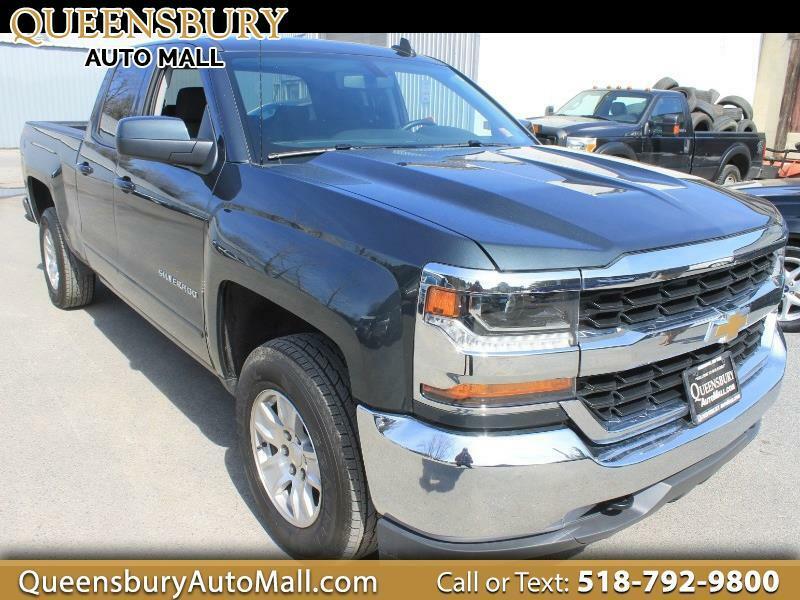 ***THE BEST PRICE ON A 2019 CHEVROLET SILVERADO LT DOUBLE CAB 4WD IN THE NORTHEAST AT QUEENSBURY AUTO MALL - COME TO 635 GLEN STREET IN QUEENSBURY, NY 12804 TO GET THE ULTIMATE VALUE BUYING THE TRUCK WITH ONLY 11K MILES AND $1000 LESS THAN THE NEXT DEALERSHIP LOCATED MILES AND MILES AWAY- LOCALLY PRICED BETTER BY $2,800 - TRADE YOUR OLD RIDE INTO THE AUTO MALL AND SAVE MORE $$$ - DON'T MISS THIS STUNNING 2019 CHEVY SILVERADO LT 4WD DOUBLE CAB FOR THE RIGHT PRICE TODAY*** 5.3L V8 OHV 16V MOTOR WITH FULL FACTORY WARRANTY COVERAGES! CLEAN CARFAX HISTORY REPORT! ONE PREVIOUS OWNER! FOUR WHEEL DRIVE WITH LOCKING TRANSFER CASE! TOW PACKAGE WITH TRAILER HITCH RECEIVER, OVER DRIVE HAUL MODE, AND ELECTRONIC TRAILER BRAKING! TOUCH LED HOME SCREEN WITH REAR VISION BACKUP CAMERA! AM/FM/CD PLAYER WITH AUXILIARY INPUT JACK, USB IPHONE INTEGRATION AND SATELLITE RADIO! FULL CABIN HEATING AND AIR CONDITIONING! FULL CABIN SAFETY AIRBAG CURTAINS AND SIDE AIRBAGS! TINTED PRIVACY WINDOWS! FULL POWER EQUIPMENT! REAR WINDOW DEFROSTER! SPLIT FOLD REAR SEATS! RUBBER FLOOR MATS! CARGO BED LIGHTING! CHROME EXTERIOR TRIM! ELECTRONIC TRACTION CONTROL SYSTEM! ALLOY WHEELS ON FRESH TIRES!